01.20.10 Officials call for limited use, more study but no ban on disputed chemical in baby bottles, other products. U.S. Food and Drug Administration officials say they now consider bisphenol A (BPA) to be of concern for fetuses, babies and young children, but at the same time say they are powerless to regulate the chemical, the Los Angeles Times reports. BPA, used to line most food and drink packaging (including canned foods, plastic baby bottles and formula cans), has been found in the urine of 93 percent of Americans tested. FDA officials say the agency supports the use of baby bottles with BPA because the benefits of sound infant nutrition currently outweigh the known risks from the chemical. However, the FDA has issued advice for limiting children and babies' BPA exposure. 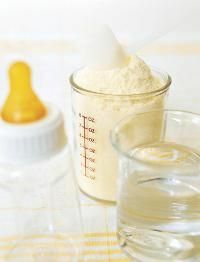 It has not banned BPA, concerned that parents of babies who rely on bottled formula would be left without healthy alternatives. Because BPA is classified as an indirect food additive, it's not subject to the same scrutiny that chemicals receive. Without additional information, it's impossible to regulate the chemical, officials say. In its announcement Friday, officials said further studies are pending (click here to read the FDA's updated statement on BPA). In December 2008, the FDA agreed to revisit its long-held stance on BPA (click here for its previous official take). Scientific studies have raised concerns about the chemical's effect on the brain, behavior and prostate glands of fetuses and the very young, including possible long-term worries of cancer, reproductive issues and behavioral problems. If you're worried about BPA in your baby's feeding accessories and other products, know that manufacturers are aware of the uproar and are busy producing safer alternatives. Check out our Buyer's Guide selection of BPA-free bottles so you can feel good at feeding time. The thought of going green while pregnant sounds overwhelming to many women—but it doesn't have to be. You can safeguard yourself, your baby and the planet from potentially toxic chemicals, if you know what to look for and avoid in your everyday products. Think you know the culprits? Take our Green IQ Quiz and find out. Your score may surprise you!